Note: Enlarge any image by clicking on it. 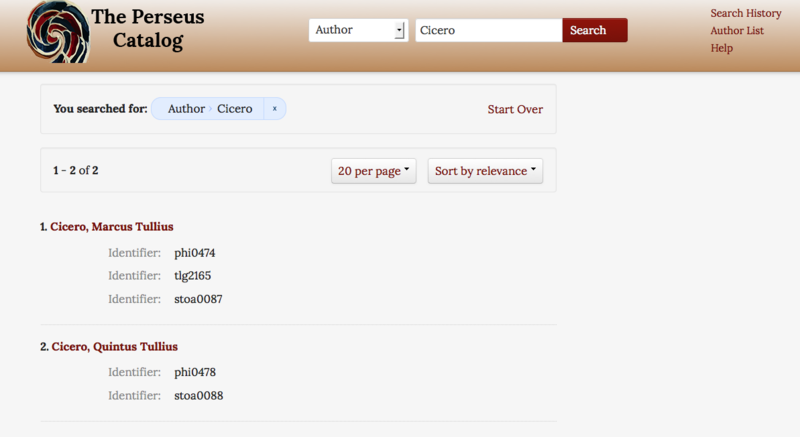 This search will find the term Cicero as the author of works, authority records with the name Cicero, Cicero in the title or uniform title of works, and any other records that contain the term. The list is automatically sorted by relevance but can also be sorted by author or title. The list of available facets at the side can be used to further narrow this list of results. 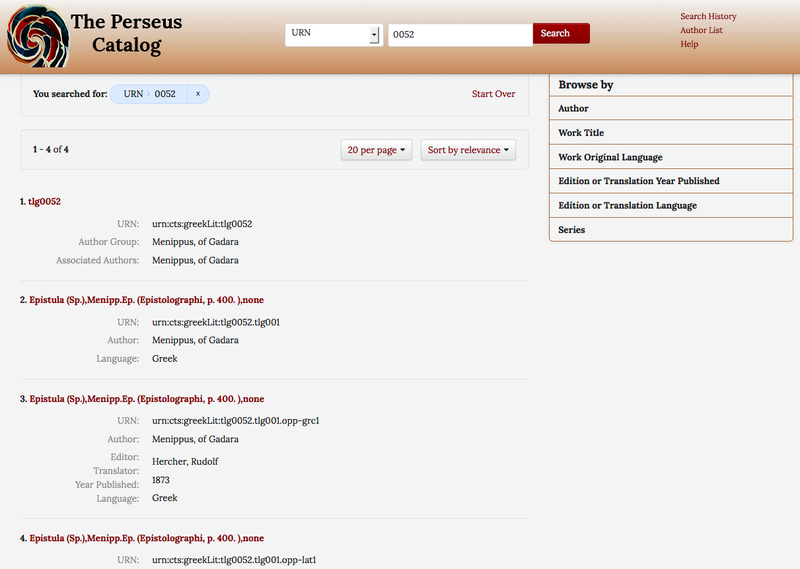 Compare this search with a search in All Fields = Perseus and note the number and variety of results. These results include both a link to the authority records for both Marcus Tullius Cicero and Quintus Tullius Cicero. 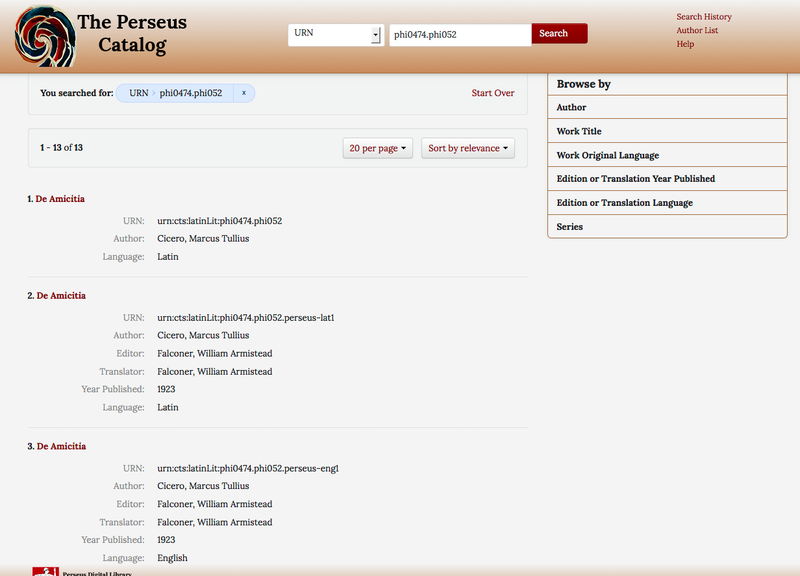 Clicking on the top level result will take the user to Marcus Tullius Cicero’s Authority Record where the user will find a list of variant names, other information, cataloged titles by this author and other information described further in the Results section. These results include both a link to the Work Record for the De Amicitia of Marcus Tullius Cicero and for the Toxaris vel Amicitia of Plutarch. 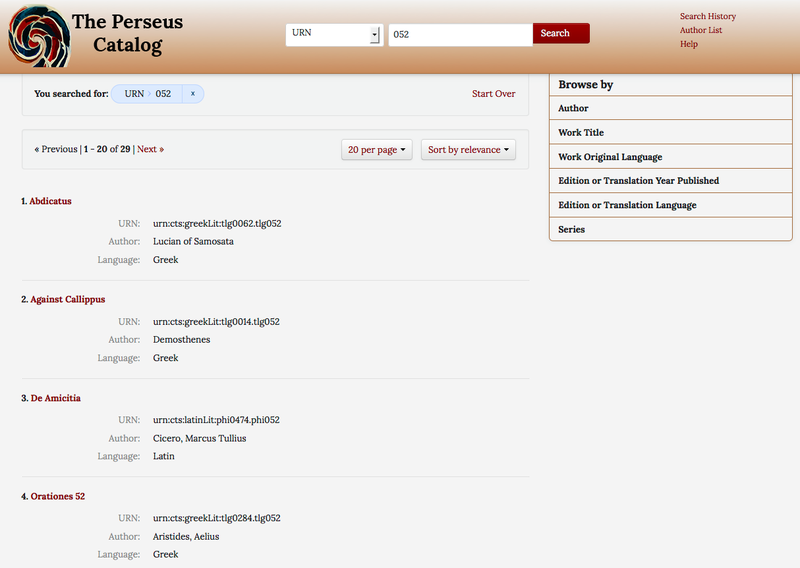 Clicking on the top level result will take the user to the top level Work Record for Cicero’s De Amicitia, which is described further in the Results section. Note: This URN format is based on the PHI numbers. Cicero is PHI author number 0474 and the De Amicitia is PHI work number 052 (of Cicero). Any searches on TLG/PHI/Stoa numbers or identifiers must use all digits of the identifier. (In other words, 0474 works, but 474 does not). Any searches on terms within the URN must be exact. So latinLit works, but Latinlit or LatinLit does not work. These results are all at the work level, i.e. there is no result for an author absent the work title. 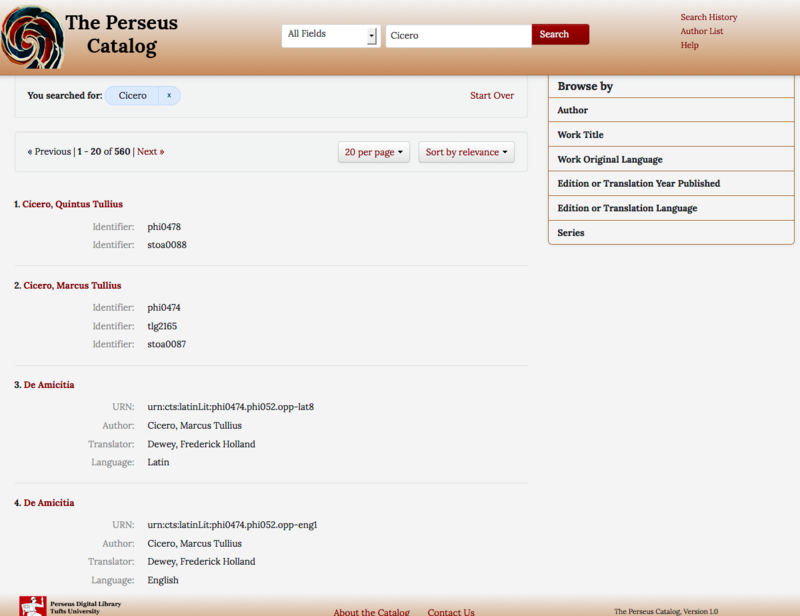 Here there are results related to the author Menippus of Gadara (TLG author identifier TLG0052). A search on 052 ≠0052. For programmatic access to search results, use the Atom Response API.